I am guessing that there are a lot of anxious people pondering that question. The optimists out there are hoping for a quick recovery. The pessimists cannot help but notice that the bad news keeps coming. Today Fannie Mae announced that it lost $2.3B in the quarter and has cut its dividend. The really bad news is that the Yahoo article implied that the the market for Alt-A securities and all of its close cousins is probably defunct. This implies that the flexibility the mortgage brokers had with low documentation loans is gone, too. This is not surprising but its impact could pull out the last support for real estate prices in the hardest hit markets. This is a “hassle” barrier for small business owners and commission based workers who might want to buy into this downturn. I think if a buyer has to put a considerably larger down payment and a lot of more income verification to get their dream house, I think that they are going to demand some type of fundamental analysis that they are buying near the bottom. 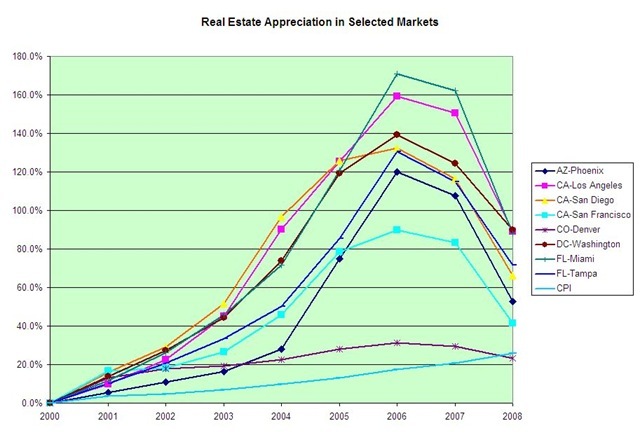 My contribution in this area is the following graph comparing real estate prices to the Consumer Price Index(CPI) for several real estate markets. Comparing real estate prices to the CPI is a traditional way of evaluating financial performance and risk. For those readers that want to know I got the CPI data from the Bureau of Labor and the real estate indexes from the S&P/Case-Shiller® Home Price. I converted all of the indexes into percentages relative to their 2000 index values. The bottom line on the graph is the Consumer Price Index. It looks like the down turn in the real estate market has a ways to go in some local markets that benefited from the real estate bubble.